Manchester food & drink news: Blank Canvas, free toastie Friday at Northern Soul & more. If you like freebies, toasties, openings, growings, closings, or winning, then we’ve got some part of you covered this week. Whether it’s a free toastie from Northern Soul this Friday, a date for Grub back at Mayfield for the summer, Levenshulme Market being up for a well deserved award, or just some good old openings and closings, read on for your food and drink fill. 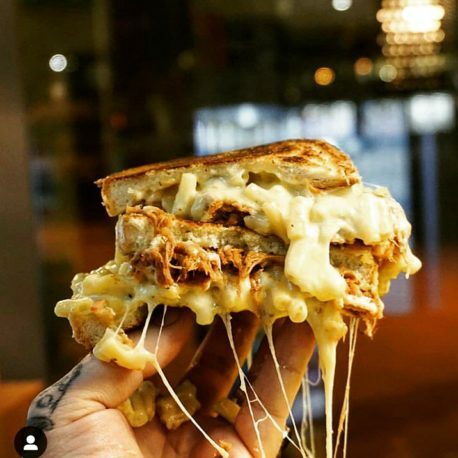 To celebrate National Grilled Cheese Day on Friday 12 April, that most revered of national holidays, Manchester’s very own toastie maestros are giving away 200 free grilled cheese sandwiches to the first 200 customers through their doors when they open at 11am. Lucky cheese fiends can get in on the action at either of Northern Soul’s locations on Church Street or Piccadilly Approach. As a fair swap, freebie fans are being asked to bring non-perishable goods in exchange for their hot sandwich, which will be donated to Not Just Soup, an organisation that helps homeless charities around the city. One of Manchester’s most popular brunch spots has finally announced an opening date for its much anticipated Deansgate branch. Federal Cafe will be stepping into their much larger second site this week as they throw open their doors on April 12th. The extra room will be welcome relief to those regularly waiting in the large queues on a weekend. The Antipodean inspirations will still be there in the coffee and food, as well as the Portuguese twist with custard tarts still on the menu. It’s not too usual for The Printworks to welcome an independent restaurant into its ranks but the chain heavy complex is set to do just that. Blank Canvas will be taking over the site of the old blink and you’ll miss it Busaba restaurant. Set to open in early May, the name hints at what is to come – the restaurants decor, as well as menu, will change with the seasons. It may sound like a gimmick, but owner Joseph Bolger’s background is anything but, with positions at Gilpin and Forest Side making an impressive pedigree. The high end cocktails from a former Gilpin bar manager will be side by side by sugar loaded Freeshakes. With plans to stay open late, this May could see a surprising new hit at The Printworks. The Produce Hall in Stockport opened to much fanfare and excitement just over a week ago, yet it has already begun to face some ire from businesses and customers not entirely sure all is as it seems. The names Flat Iron and Doughboys may be familiar to foodies who venture into the market, but the respective London and Leeds operations have nothing to do with their namesakes in the market. The suggestion that the eateries are independent also seems to fall down, when it becomes clear all but one are owned by The Produce Hall’s owner Steve Pilling. That said, a food market in Stockport can only be a good thing for the area – so watch this space for a review to follow. Now open, The Produce Hall, 22 Market Place, Stockport SK1 1EU. Follow @TheProduceHall for up to date info. This June sees Oxford Road’s boxpark, Hatch, explode in size as it grows to nearly 12,000 square foot. The current imprint of the site is under 3,000 so there’s a whole heap of additions to the shipping container village. Spreading out under the flyover will be a double decker bus turned Vietnamese kitchen, as well as a space for gigs, and a terrace for DJs. With intentions for this to become a firm feature of the new Circle Square village (the old BBC site), there will be a variety of new retail outlets alongside the food and drink offerings. ‘Phase Two’ opens Jun, Hatch, Oxford Road, Manchester M1 7ED. Tel: 0333 323 2238. Follow @Hatch_MCR for more up to date info. Levenshulme Market’s ever growing popularity should mean it comes as little surprise that it has got to the final three in BBC Food and Farming Awards. The market is nominated alongside two other North West organisations, Bolton’s A Small Good Thing, and Liverpool’s Squash Liverpool in ‘Best Shop or Market’ category. The winner will be announced in Bristol on 12 June after judges visit the contenders and meet with customers and stall holders. If you want to see why it’s nominated, you can check it out every weekend in Levenshulme, or at their pop-up on Tuesday’s during term time at University of Manchester. Weekends Mar-Dec, Levenshulme Market, Stockport Road, Manchester M19 3AB. Follow @levymarket to see how they get on. Manchester’s street food honchos, Grub, have announced the plans for their Spring and Summer return to Mayfield Depot. The first weekend of May sees the outdoor eateries spring back up at an expanded Mayfield site for the sunny months. With regular favourites like Parmstar back for the first weekend, it’s unlikely they will have much difficulty filling the space for the Mayday Bank Holiday. Every weekend from Fri 3 May, GRUB, Baring Street, M1 2PZ. Follow @GRUBMCR for more info. Despite opening less than a year ago, Thomas Street vegan cafe and bar Folk & Soul has closed its doors. In a post on Instagram over the weekend, the cafe informed guests that they had closed down but suggested they may well be back in some form or another in the near future. The old Odd site is now lying empty for the second time in 12 months, but if anything is to happen with it, we’ll be sure to keep you informed. For more food and drink news and events in Manchester click here.